There's an interesting story behind this puppy, Mackay. Mike Fousie, who lives in Portland, OR, absolutely loves the breed and lost his buddy Jacob on Jan 3, 1997. Jacob was a seventeen year old male neutered MS. He and Mike were as close as man and animal can be. They were best friends. Mike, broken hearted, turned to the Internet for comfort and looked for web sites about Miniature Schnauzers. He came across our web page and wrote about the extreme anguish he was going through over the loss of Jacob - he was very, very distraught. Patty and I were scheduled to be in Portland the next week for dog shows. Mike was eager to meet with us and see the quality Miniature Schnauzers at the dog show. In the following months, he convinced us he would make a great pet home. It so happens our Katie's 3rd litter was likely conceived on January 3rd, 1997 - the day Mike lost Jacob. We told him we might have a companion puppy out of that litter. In March, Mike said he was traveling through Washington State heading back to Portland on the 3rd about 8:30PM and was struck with an intense feeling that Katie ought to be having her litter that very moment. Returning home that evening he immediately wrote an email and we checked our records - little blue-collar boy was born at 8:31 that evening (we use colored rickrack around each pup's neck to identify the puppies). We thought "Uh oh - something's in the cards here". As we evaluated the puppies later on, blue-collar had show potential in our estimation, a puppy we normally wouldn't place in a pet home. But Patty and I both agreed little blue-collar boy had to go to Mike. Mike waited patiently while we did our usual training thing with the puppies, and finally came up from Portland to get him in early June. It was obvious from first sight that those two were made for each other. "Blue" also had the best personality in the litter. Mike was a career Photo-Journalist who worked full-time for KATU-TV in Portland and took "Mackay" (pronounced Mac-Eye), every day to the studio with him, and Mackay got to be a somewhat famous dog in Portland. 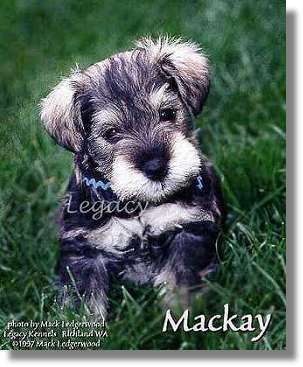 Mackay is a Scottish Clan name meaning "Son of Fire". Though Mackay was not in the show arena, he was a wonderful ambassador for the breed. Mike also has a Virtual Reality Imaging company called "LightCurve Design", www.lightcurve.com, which now reflects his retirement lifestyle. "Mac" was featured there. They were quite a pair - we saw them every time we went to Portland for the shows there. The years have passed by incredibly fast it seems. Mike finally retired and lives full-time in his Dutch Star motorhome, traveling around with Mac. He has wintered in Arizona and spent summers as a campground host at Zion National Park in Utah. Tragically, Mac fell ill from old age complications and eventually had to be euthanized in June, 2008. See Mike's blog entry about losing Mac. We selected a new pet Miniature Schnauzer for Mike. His name is Legacy's True Blue ("Blue") and he went to live with Mike in August, 2008. Blue is a real character, an athletic dog who will not be a Mac replacement but will earn his own identity in Mike's life. We wish the best of everything for both of them. All Rights Reserved Web pages designed and maintained by LegacyMS.